We take a look this week at an exceptional success story concerning one of Europe’s largest trucking (RFS) companies. Georgi Transporte, which was founded in Germany back in the early fifties, and which has grown into one of Europe’s most well-known and versified air cargo trucking companies. We’ll never know whether Siegfried Georgi and his wife ever imagined that they would be the initiators of today’s Georgi Transporte when they started up their small transport company in Aue, Saxony in 1953. The company is today still a ‘family affair,’ run by Siegfried’s son Juergen along with his son Christian. But - much has changed in those more than six decades when Siegfried moved from East Germany to Siegen in today’s West Germany in 1960. It was there that he started up a modest truck repair shop with four staff and also had a small fleet of MG trucks which mainly were used for short distance transport. It was in 1961, the same year that Juergen Georgi was born, that the senior obtained his first real truck and trailer. 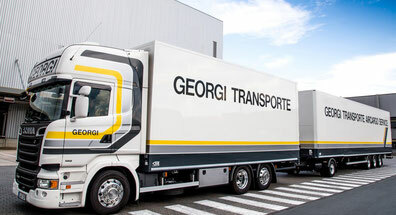 This was the cornerstone of today’s Georgi Transporte which in the meantime operates air cargo (RFS) services with more than 350 own trucks throughout all of Europe. 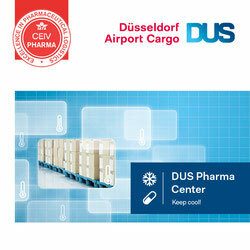 In the early years, there was hardly any air cargo truck transport within Germany and Europe. It was in the early 1980s that Georgi working with his fleet of three trucks was sub-contracted work by other larger companies for air cargo transport. By 1982, Juergen Georgi was also fully involved in the company and was able to gain contracts with Pan Am, British Airways and later with Air France. The big breakthrough came in 1986 when Georgi, now operating with ten large trucks, managed to win the Cathay Pacific contract between Frankfurt and London Heathrow Airport. By then Georgi was operating with enclosed trucks using roller beds for full pallet loads (ULDs). By early 1990 air cargo transport between various cities in Europe was common and competition for Georgi grew fast, especially from truckers in neighbouring countries. However, despite this, Georgi Transporte continued to expand their service portfolio and grew also to become Lufthansa Cargo’s main trucking supplier. For the following two decades Georgi grew step by step and were recognised as one of Europe’s most reliable air cargo truckers. The economic crisis of 2010 forced Juergen Georgi to rethink company policy for the future and it was there that he placed more emphasis on pharmaceutical transport, hi-value transport, specialized DGR transport, and positioning of aircraft engines from one city to another in Europe. 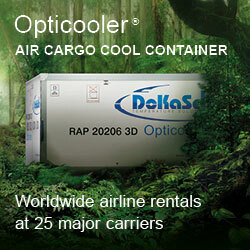 This move, along with the traditional air cargo transport, proved to be highly beneficial for the trucker. Georgi are proud of their GDP and TAPA TSR1 certification and are also fully ISO 9001 and ISO 14001 certified. On top of this, all of Georgi’s 350 trucks are up-to-date as far as green emissions rules are concerned and are all Euro 6 certified. Juergen Georgi is rightly proud of what the family business has achieved over the past years, but also realizes that the company must continue to strive for new business avenues in the future. Son, Christian is in the meantime in charge of pricing and marketing and has his own visions on how best to keep Georgi on the road in the future. 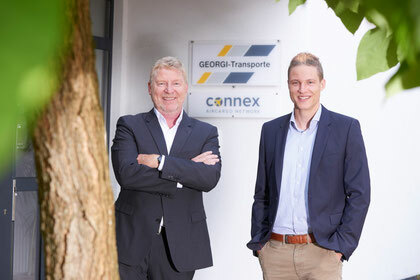 The company in the meantime boasts more than 600 staff of which around 450 are full time drivers and operates on every major European airport FTL and LTL with its subsidiary Connex Aircargo Network, also based at Frankfurt Airport. Process management is being realigned to meet future demands and is essential Christian states, in order to remain competitive and give clients enhanced services in the future. In addition, staying close to the market and being able to look on it from more than one direction is a key for future growth, he mentions. A new office has been opened in Amsterdam, aside from their offices in Frankfurt and Prague. Others are being planned to allow Georgi to offer an even more comprehensive service in the future. Georgi operate their own maintenance and truck parking facility in Moerfelden, which is just a stones throw away from Frankfurt Airport. Juergen Georgi explains that this allows them complete flexibility in positioning trucks when needed into the airport and keeps costs down as well as offering drivers suitable rest facilities. A solid family business which looks positively towards the challenges ahead!